A buffalo stands alone on the plains at the Tallgrass Prairie Preserve near Pawhuska in northeastern Oklahoma. We were headed to Osage county in northeastern Oklahoma where representatives of the Osage Nation had a full day of activities planned for us. We left bright and early because there was so much to see and do ahead of us. I was looking forward with great anticipation to visiting Shidler and Pawhuska. Pawhuska is the capital of the Osage Nation and has a fascinating history, but it is also the home of the National Indian Taco Championship. I love Indian tacos! I consider myself an Indian taco expert and that is why I volunteered to be a judge at the Annual National Indian Taco Championship held in Pawhuska. Now if you’re not familiar with an Indian taco, let me explain. Traditional American Indian fry bread (which is exactly what it sounds like—fried bread dough) is used as a scrumptious base for toppings that include meat, beans, lettuce, onions, tomatoes and cheddar cheese piled high and sometimes capped off with sour cream or salsa. In Oklahoma, you can always find an Indian taco at the Oklahoma State Fair, and typically you can find them at other festivals throughout the state as well. And don’t even ask me if I want to split one with you; I can eat the whole dinner-plate sized meal by myself. But I digress - back to our tour. We began our journey at The Bivin Garden just outside of Shidler. What started as a private residential garden has become six acres of local lore. Ray and Mollie Bivin built their home on uncultivated prairie land back in 1981. It is said that Mollie missed the manicured gardens of her native Great Britain and started an Oklahoma garden of her own. As the years went by, she and her husband mastered the art of gardening on the plains of Osage County. Soon word spread and people were asking to visit the garden in their backyard, and that is how it all began. From May to September you can visit the garden on weekends and during the week by appointment. In addition to hundreds of flowers, the property includes beautiful ornamental ponds and even a peacock or two. Beware of the bumblebees though; they’re a busy bunch at The Bivin Garden. As we finished our decadent deserts, we shared funny stories of our day in the beautiful Osage Nation while the sun set. Prairie Rattler Winery, located just a stone's throw from Bivin Garden, is owned and operated by a husband and wife team, Rick and Paula Hammer. They welcomed us to our second stop of the day, and they were great hosts. Rick explained how their burgeoning little winery makes its wine, and Paula showed us some of her most recent canned goods. We had a free wine tasting in their quaint tasting room, but sadly Rick was out of the pineapple wine that he had piqued our curiosity with earlier. He told us about a new cranberry wine that he’s working on, and we thought that would make a great holiday wine. I wish Rick and Paula the best; they really know how to take care of their customers. Around noon, we met up with Paula Stabler, the Communications Officer for the Osage Nation. She was kind enough to introduce us to the staff of the Osage Nation Museum. It is the oldest tribally-owned museum in the state, and it was here that I was first introduced to the “2,229.” Back in 1906, the Osage reservation lands were divided amongst the remaining 2,229 members of the tribal nation. As an original allottee, each member received “head rights,” and with those rights they shared in the profits from oil and minerals found on their land. During this time in history, the Osage people were known as the “richest people in the world.” Unfortunately, those rights were an easy target of greed. There were a string of murders in the 1920s directly linked to the pursuit of “head rights” monies, and the FBI was called in to help the nation solve these heinous crimes. With that dark history behind them, the Osage Nation continues to grow and prosper and looks to the future with tenacity and optimism. After a tour of the Osage Tribal Museum, Library & Archives, our group headed out to the Tallgrass Prairie Preserve. This is the largest protected tallgrass prairie in North America. 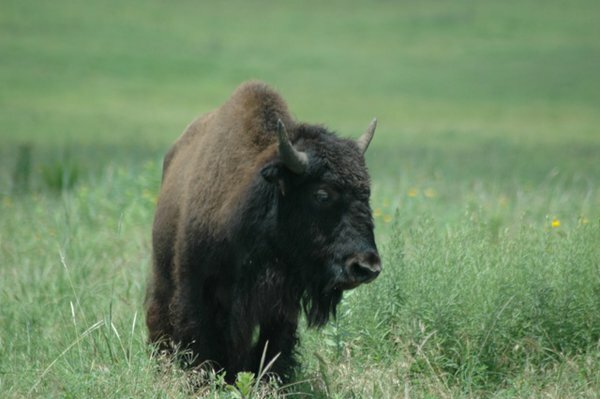 In it, you’re able to see 300 species of birds, deer, bobcats, armadillos and bison, otherwise known as buffalo. Most people come to see the bison, and the herd currently numbers around 2,500. Not bad for a herd that started with only 300 head back in 1993. We enjoyed a wonderful native Osage lunch of meat pies provided by Paula in the shade of a 100-year-old walnut tree near the visitor center. When we finished lunch we proceeded to the park's visitor center and heard a brief history from one of the volunteers. She was also kind enough to take us on a tour of the 80-year-old bunk house located on the grounds. It was used by ranch hands in years gone by and has been meticulously kept in its original condition. Aside from some new quilts on the bunks, everything else is as it was back in the 1920s. There is an annual round up of the bison herd for health screenings and inoculations and the cowboys that come to help are treated to a stay in the old bunk house. The Nature Conservancy is the keeper of this American treasure and they received 11 thumbs up from us for their efforts! Chief Lookout Memorial & Lookout Mountain was our next destination and it gave us a breathtaking view of Osage County from the top of Lookout Mountain. Chief Fred Lookout and his wife Julia are buried there and hold a very dear place in the hearts of the Osage people. He was the last chief of the Osages who inherited his title by blood and he is remembered as a very benevolent leader. Next up on our itinerary was a visit to Osage Hills State Park. Tucked in between Sand Creek and Lookout Lake, Osage Hills State Park has much to offer. There are eight rustic cabins that include fireplaces, 55 campsites, semi-modern RV sites, a nice swimming pool and even tennis courts. There are several historic structures in the park, like native stone picnic shelters and cabins, that were built by the Civilian Conservation Corps during the 1920s and '30s that only add to the fabulous ambience of the place. Osage Hills would be a gorgeous fall foliage viewing area and the thought of a cabin with a roaring fire gave me the idea for a trip later in the year with my family. The story of the “Million Dollar Elm” is a well-known tale among the Osage people. A majestic elm tree in Osage County was the site of many deals made between the oil barons and the landowners of the oil-rich Osage tribe. It is said that in the shade of that tree, millions of dollars changed hands in the form of land leases. Hence the former name of the Osage Casino located outside of Bartlesville. This sleek and modern facility gives gamers the chance to try their luck at slot machines and table games. Our main goal for the evening was to enjoy a meal at the casino’s Fresh Market Buffet. Everyone found something to oooh and ahhh over, whether it was Mexican, Asian or just good down home cooking. As we finished our decadent deserts, we shared funny stories of our day in the beautiful Osage Nation while the sun set over the rolling hills framed in the magnificent picture windows of the dining area. Mid-May is generally when the National Indian Taco Championship is held in Pawhuska. Be sure to bring your appetite for the traditional and desert tacos. In addition to the delicious food, there is live entertainment, vendor booths and local shops open for business. A great day trip for a family. When visiting the Tallgrass Prairie don't forget to bring your binoculars for best bison viewing. At Osage State Park with its native stone picnic shelters and rustic cabins, this would be a great place for a family reunion. Schedule your trip in the fall so you enjoy the splendor of the fall foliage and coziness of the cabin fireplaces. The Event Center at the Osage Casino books world class entertainers. Before you head to Osage County check the event calendar and enjoy a great concert or event at the casino.